The 2016 Pittsburgh Steelers season is the franchise's 84th season as a professional sports franchise and as a member of the National Football League (NFL). It will also mark the 17th season under leadership of general manager Kevin Colbert and the tenth under head coach Mike Tomlin. For the first time since 2004, tight end Heath Miller will not be on the opening day roster, as he announced his retirement on February 19. The Steelers are the first team since the 2011 Green Bay Packers to play on both Christmas Day and Thanksgiving. All the games on their schedule take place in the Eastern time zone. The Steelers traded a conditional fifth-round selection (#164 overall) to the Philadelphia Eagles in exchange for cornerback Brandon Boykin — contingent upon Boykin playing 60% of the snaps with the Steelers during the 2015 season. The Steelers traded their original sixth-round selection (#201 overall) to the Jacksonville Jaguars in exchange for placekicker Josh Scobee. The Steelers acquired a sixth-round compensatory selection (#220 overall) as a result of the departure of Brice McCain during the 2015 free agency period. The Steelers acquired an additional seventh-round selection (#229 overall) in a trade that sent punter Brad Wing to the New York Giants. All undrafted free agents were signed after the 2016 NFL draft concluded on April 30 unless otherwise noted. The Steelers' preseason opponents and schedule was announced on April 7. Dates and times were announced on April 14. The Steelers' regular season schedule was announced on April 14. WAS – Dustin Hopkins 31-yard field goal, 5:56. Redskins 3–0. Drive: 9 plays, 54 yards, 3:24. WAS – Dustin Hopkins 40-yard field goal, 1:08. Redskins 6–0. Drive: 5 plays, 14 yards, 2:38. PIT – Antonio Brown 29-yard pass from Ben Roethlisberger (Chris Boswell kick), 10:10. Steelers 7–6. Drive: 11 plays, 75 yards, 5:58. PIT – Eli Rogers 3-yard pass from Ben Roethlisberger (Chris Boswell kick), 0:27. Steelers 14–6. Drive: 14 plays, 67 yards, 5:52. PIT – Chris Boswell 46-yard field goal, 11:18. Steelers 17–6. Drive: 8 plays, 47 yards, 3:42. PIT – Antonio Brown 26-yard pass from Ben Roethlisberger (Chris Boswell kick), 7:01. Steelers 24–6. Drive: 5 plays, 75 yards, 2:04. WAS – Dustin Hopkins 34-yard field goal, 2:01. Steelers 24–9. Drive: 9 plays, 52 yards, 5:00. WAS – Chris Thompson 1-yard run (Dustin Hopkins kick), 13:01. Steelers 24–16. Drive: 7 plays, 77 yards, 2:18. PIT – DeAngelo Williams 15-yard run (Chris Boswell kick), 5:48. Steelers 31–16. Drive: 13 plays, 73 yards, 7:13. PIT – DeAngelo Williams 6-yard run (Chris Boswell kick), 1:54. Steelers 38–16. Drive: 6 plays, 45 yards, 2:23. The Steelers opened their 2016 season on the road against the Redskins. In the first quarter, the Skins got on the board jumping out to a 6–0 lead with two field goals kicked by Dustin Hopkins from 31 and 40 yards out. In the second quarter it was all Steelers as they jumped out to leads of 7–6 and 14–6 at halftime when Ben Roethlisberger found Antonio Brown and Eli Rogers on 29-yard and 3-yard touchdown passes. After the break, the Steelers moved ahead 24–6 when Chris Boswell nailed a 46-yard field goal while Roethlisberger found Brown on a 26-yard touchdown pass. The Skins tried to rally later on in the quarter, but could only get away with a 34-yard field goal from Hopkins making the score 24–9. Though in the fourth quarter, they would eventually pull within 8 when Chris Thompson ran for a 1-yard touchdown making the score 24–16. Later on in the quarter, the Steelers sealed the game when DeAngelo Williams ran for two touchdowns from 15 and 6 yards out to make the final score 38–16. With the win, the Steelers started their season 1–0. PIT – Xavier Grimble 20-yard pass from Ben Roethlisberger (Chris Boswell kick), 3:46. Steelers 7–0. Drive: 5 plays, 66 yards, 1:43. CIN – Mike Nugent 25-yard field goal, 0:23. Steelers 7–3. Drive: 8 plays, 68 yards, 3:23. PIT – Chris Boswell 49-yard field goal, 4:10. Steelers 10–3. Drive: 4 plays, 6 yards, 0:55. CIN – Mike Nugent 33-yard field goal, 0:00. Steelers 10–6. Drive: 8 plays, 53 yards, 0:48. PIT – Jesse James 9-yard pass from Ben Roethlisberger (Chris Boswell kick), 6:16. Steelers 17–6. Drive: 7 plays, 91 yards, 3:20. CIN – Mike Nugent 21-yard field goal, 2:10. Steelers 17–9. Drive: 10 plays, 72 yards, 4:06. PIT – DeAngelo Williams 4-yard pass from Ben Roethlisberger (Chris Boswell kick), 6:48. Steelers 24–9. Drive: 12 plays, 68 yards, 6:54. CIN – Giovani Bernard 25-yard pass from Andy Dalton (Mike Nugent kick), 3:25. Steelers 24–16. Drive: 8 plays, 75 yards, 3:23. The Steelers played their first home game of the year against the division rival Bengals in a rematch of the 2015 AFC Wild Card game. In the first quarter, the Steelers struck first when Ben Roethlisberger found Xavier Grimble on a 20-yard touchdown pass for a 7–0 lead. The Bengals came within 4 later on in the quarter when Mike Nugent kicked a 25-yard field goal for a 7–3 game. In the second quarter, the Steelers moved back into the lead when Chris Boswell kicked a 49-yard field goal to make it 10–3. The Bengals came within 4 again when Nugent kicked a 33-yard field goal to make it 10–6 at halftime. In the third quarter, the Steelers moved ahead by double digits when Roethlisberger found Jesse James on a 9-yard touchdown pass to make it 17–6. The Bengals reduced the lead when Nugent kicked another field goal from 21 yards out to make it 17–9. In the fourth quarter, the Steelers pulled away as Roethlisberger found De'Angelo Williams on a 4-yard touchdown pass to make it 24–9. Though the Bengals wrapped up the scoring of the game when Andy Dalton found Giovani Bernard on a 25-yard touchdown pass to make the final score 24–16. With the win, the Steelers started 2–0 for the first time since 2010. The Steelers traveled across the state to take on their in-state rival Eagles. In the first quarter, the Eagles drew first blood when Caleb Sturgis kicked a 29-yard field goal for a 3–0 lead. In the second quarter, they increased their lead when Carson Wentz found Jordan Matthews on a 12-yard touchdown pass to increase their lead to 10–0. Chris Boswell then got the Steelers on the board when he kicked a 40-yard field goal making the score 10–3. Sturgis wrapped up the first half scoring with another field goal from 38 yards out to make it 13–3 at halftime. After the break, the Eagles got back to work in the third quarter as Wentz found Darren Sproles on a 73-yard touchdown pass to make it 20–3. This would be followed by 2 touchdowns: Wendell Smallwood ran for a 1-yard touchdown while Kenjon Barner ran for an 8-yard touchdown to make the score 27–3 and 34–3. With a scoreless fourth quarter, that would turn out to be the final score of the game. With the loss, the Steelers fell to 2–1 and second place in the AFC North. Roethlisberger's record also fell to 0–2 in Philadelphia and 2–2 against the Eagles. Tomlin's record fell to 1–2 against the Eagles. The team was also held without a touchdown in a game since their 26–6 loss against the Ravens during Week 2 in 2014. After a horrifying road loss, the Steelers returned home for a Sunday Night duel against the Chiefs. Through the first half, it was all Steelers starting in the first quarter when Ben Roethlisberger found Darrius Heyward-Bey on a 31-yard touchdown pass with a successful 2-point conversion to make it 8–0. This was followed up with Roethlisberger finding Antonio Brown on 2 consecutive touchdown passes: from 4 and 38 yards out to make the score 22–0. In the second quarter, they made the halftime score 29–0 when Roethlisberger found Jesse James on a 9-yard touchdown pass. In the third quarter, Markus Wheaton caught a 30-yard touchdown pass from Roethlisberger to make the score 36–0. In the fourth quarter, the Chiefs finally got on the board when Alex Smith found Tyreek Hill on a 10-yard touchdown pass to make it 36–7. Though the Steelers pretty much sealed the game when De'Angelo Williams ran for a 2-yard touchdown to make it 43–7. The Chiefs then wrapped up the scoring of the game when Smith found Travis Kelce on a 3-yard touchdown pass to make the final score 43–14. With the win, the Steelers improved to 3–1. With the Ravens' loss to the Raiders earlier in the day, they move into a tie at the top of the AFC North. The Steelers set a franchise record with 22 total points scored in the first quarter. The team also snapped their streak of consecutive games with at least a giveaway. Roethlisberger who had thrown 6 touchdown passes and 4 interceptions through the first 3 games had thrown 5 touchdown passes and no interceptions in this game alone. The Steelers stayed home for a game against the Jets. In the first quarter, the Jets took an early 3–0 lead when Nick Folk kicked a 30-yard field goal. Later on, the Steelers took the lead when Ben Roethlisberger found Sammie Coates for a 72-yard touchdown pass to make it 7–3. The Jets scored 10 straight points in the second quarter: Folk kicked a 48-yard field goal to come within a point, 7–6. This would be followed by Ryan Fitzpatrick finding Brandon Marshall on a 15-yard touchdown pass to make it 13–7. The Steelers wrapped up the scoring of the half when Roethlisberger found Jesse James on a 1-yard touchdown pass to make it 14–13 at halftime. In the second half it was all Steelers. Starting in the third quarter, Chris Boswell put the team up by 4 with a 47-yard field goal to make it 17–13. In the fourth quarter, they would score 2 touchdowns: Roethlisberger found Antonio Brown on a 5-yard pass and then Coates on another 5-yard pass to make the score 24–13 and the eventual final score 31–13. With the win, the Steelers improved to 4–1. With the Ravens' loss to the Redskins, the team is also now in outright first place in the AFC North. 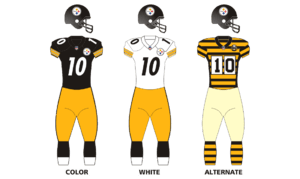 This would be the final game the Steelers would wear their 1934 throwback uniforms. The Steelers traveled to Miami to take on the Dolphins. In the first quarter, the Phins struck first when Andrew Franks kicked a 30-yard field goal for a 3–0 lead. The Steelers got on the board later on in the quarter taking the lead when Darrius Heyward-Bey ran for a 60-yard touchdown (with a successful 2-point conversion) for an 8–3 game. In the second quarter, it was all Phins as they closed out the half by first coming within 2 when Franks kicked a 23-yard field goal to make the score 8–6. The Phins eventually took the lead back when Franks kicked another 30-yard field goal for an 9–8 game. They would move ahead by a touchdown when Damien Williams ran for one from a yard out to take a 16–8 lead at halftime. In the third quarter, the Phins got back to work when Jay Ajayi ran for a 1-yard touchdown to make the score 23–8 for the only score of the period. The Steelers tried to rally when Ben Roethlisberger found Cobi Hamilton on a 23-yard touchdown pass shortening their deficit to 8, 23–15. Though the Steelers' rush defense stalled with less than a minute left in the game and Ajayi ran for a 62-yard touchdown to seal the game with the final score 30–15. With the loss, the Steelers fell to 4–2. Ben Roethlisberger would be knocked out of the game due to injury in the second quarter. Though he played in the second half. The Steelers still remained in first place with the Ravens' loss to the Giants. The Steelers went back home for another showdown with the Patriots. This game is notable for being the very first game that QB Ben Roethlisberger would miss out on against the Patriots. In the first quarter, The Patriots scored first when Tom Brady found James White on a 19-yard touchdown pass for a 7–0 lead for the only score of the period. In the second quarter, they increased their lead when LaGarrette Blount ran for a 3-yard touchdown to make it 14–0. The Steelers got on the board later on in the quarter when Landry Jones found Darrius Heyward-Bey on a 14-yard touchdown pass for a 14–7 game. The Steelers closed out the scoring of the first half when Chris Boswell kicked a 32-yard field goal for a 14–10 game at halftime. In the third quarter, the Steelers went back to work as Boswell kicked another field goal to get his team within 1, 14–13 from 46 yards out. The Pats pulled away later on when Brady found Rob Gronkowski on a 36-yard touchdown pass (with a failed PAT) for a 20–13 game. In the fourth quarter, the Steelers came within 4 again when Boswell made a 44-yard field goal for a 20–16 game. But the Pats sealed the game after Blount ran for a 5-yard touchdown and the eventual final score of 27–16. With the loss, the Steelers went into their bye week at 4–3. Regardless, due to the Ravens' loss to the Jets, they still remain in first place in the AFC North. The team dropped to 0–1 on the season without Roethlisberger as a starter and their seven-game home winning streak was snapped. Coming off of the bye week, the Steelers traveled to Baltimore to take on their division rival Ravens. The game received much hype in spite on QB Ben Roethlisberger returning from injury. Through the first half it was all Ravens when Joe Flacco found Mike Wallace on a 95-yard touchdown pass to move up 7–0 in the first quarter. This was followed by Justin Tucker's 49-yard field goal in the second to make it 10–0 at halftime. In the third quarter, the Ravens went back to work as Tucker went for a 42-yard field goal to make it 13–0. In the fourth quarter, Chris Moore blocked a punt and returned it 14 yards for a touchdown with a (successful 2-point conversion) to make it 21–0. Later on in the game, the Steelers finally got on the board as Roethlisberger found Antonio Brown on a 23-yard touchdown pass making the score 21–7. They wrapped up the scoring later on when Roethlisberger ran for a touchdown himself from 4 yards out making the final score 21–14. With their third straight loss, the Steelers fell to 4–4 and move into a tie with the Ravens for the lead in the AFC North. The loss was also the Steelers' fourth straight loss to the Ravens. The Steelers traveled home to take on the Cowboys. They would draw first blood in the first quarter when Ben Roethlisberger threw a 2-yard touchdown pass to Le'Veon Bell (with a failed 2-point conversion) for a 6–0 lead. The Cowboys got on the board when Dan Bailey kicked a 37-yard field goal for a 6–3 game. The Steelers pulled away as Roethlisberger found Eli Rogers on a 3-yard touchdown pass for a 12–3 game. The Boys came within 2 as Dak Prescott found Ezekiel Elliott on an 83-yard touchdown pass to make the score 12–10. In the second quarter, the Boys took the lead as Bailey 53-yard field goal for a 13–12 game. The Steelers wrapped up the scoring of the first half when Chris Boswell kicked a 39-yard field goal taking a 15–13 halftime lead. After the break, the Steelers went back to work as Boswell nailed a 25-yard field goal to move ahead by 5, 18–13. The Boys then scored on 2 consecutive plays: Bailey nailed a 46-yard field goal followed up by Prescott finding Dez Bryant on a 50-yard touchdown pass to make the score 18–16 and retake the lead 23–18. The Steelers retook the lead in the fourth quarter when Bell ran for a 1-yard touchdown (with a failed 2-point conversion) to make the score 24–23. Though the Boys pushed back into the lead when Elliot ran for a 14-yard touchdown (with a failed 2-point conversion) to make the score 29–24. The Steelers moved back into the lead with Roethlisberger's 15-yard touchdown pass to Antonio Brown (with a failed 2-point conversion) for a 30–29 game. However, the Boys were able to complete the comeback when Elliott ran for a 32-yard touchdown (with a failed 2-point conversion) to make the final score 35–30. With their fourth straight loss, the Steelers fell to 4–5 and second place in the AFC North. After a tough home game against the Cowboys, the Steelers traveled to Cleveland for Game 1 against the Browns. In the first half, it was all Steelers starting in the first quarter when Chris Boswell made a 32-yard field goal for a 3–0 lead. They would increase their lead in the second quarter when Boswell made a 33-yard field goal followed up by Le'Veon Bell running for a 1-yard touchdown with a successful 2-point conversion to make it 6–0 and then 14–0 at halftime. In the third quarter, the Browns finally got on the board as Cody Parkey made a 24-yard field goal to make the score 14–3. The Steelers however pulled away as Boswell kicked a 22-yard field goal. In the fourth quarter, the Browns drew closer as backup QB Josh McCown threw a 14-yard touchdown pass to Gary Barnidge (with a failed PAT) to make the score 17–9. However later on, the Steelers sealed the game when Javon Hargrave recovered a fumble in the end zone to make the final score 24–9. With their four-game losing streak coming to a stop, the Steelers improved to 5–5. Also, they move back into a tie on top of the AFC North due to the Ravens' loss to the Cowboys. After winning over the Browns, the Steelers traveled further west to take on the Colts in a rematch of 2015's 45–10 blowout win. The Steelers struck first in the first quarter when Le'Veon Bell ran for a 5-yard touchdown to take a 7–0 lead. This would be followed by Ben Roethlisberger finding Antonio Brown on a 25-yard touchdown pass later on in the quarter to make it 14–0. The Colts got on the board in the second quarter when QB Scott Tolzien, starting in place of the injured Andrew Luck, found Donte Moncrief on a 5-yard touchdown pass to make it 14–7. However, the Steelers pulled away as Roethlisberger found Brown again this time on a 33-yard touchdown pass for a 21–7 lead at halftime. After a scoreless third quarter, the Steelers sealed the game with the only points in the second half when Roethlisberger found Brown again this time on a 22-yard touchdown pass and the eventual final score of 28–7. With the win, the Steelers improved to 6–5. Roethlisberger's record as a starter improved to 1–1 on Thanksgiving Day. The Pittsburgh Steelers will come back home to take on the Eli Manning-led Giants in America's Game of the Week. Wikimedia Commons has media related to 2016 Pittsburgh Steelers season.